…at florals! What a way to celebrate May Day, huh? 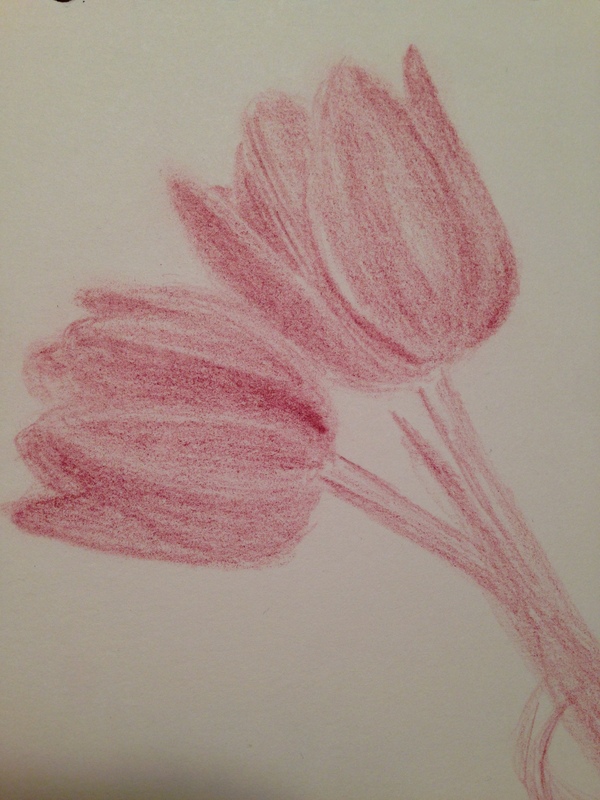 These tulips were done with a Polychromos colored pencil. I still think colored pencil is a fun medium, especially with the Polys. The only problem is, it can take awhile. You could go on layering forever, if you wanted to. It’s pretty zen though. This painting is the size of a business card. It’s all watercolor: rose madder and sap green….and maybe another color I’m forgetting (but I don’t think so). It was quick and simple, but I did have to sketch it in pencil first. I tried working without a sketch, but you wouldn’t wanna wake up in the morning to that, lol. I’m pretty pleased with this, and totally hooked on making very small watercolor paintings. I’ll hopefully have more of those to share with you tomorrow. With petals floating in the breeze, it’s time to celebrate the first weekend in May! It’s bound to be a beauty. Treat yourself to something wonderful today. Life is not a dress rehearsal. Peace, everyone. Beautiful watercolor! You should be pleased. Yes, I agree about pencils, I do like the Zen aspect of moving the pencil and layering. Good analogy, I never thought of it that way before. And it does seem to work well for flowers. It’s also interesting how different the feel of different kinds of pencils is. I’m still figuring out what I like best there. Thank you so much! Yeah, I’ve bought lots of single pencils open stock….I think the only one I liked better than the Polys was by Caran d’Ache, which was twice their price and not that much difference between the two. Open stock is a terrific concept, as a set of pencils is an investment. At least Blick lets you return anything though, for any reason, even if open, something I really appreciate about them. I hope you find your favorite! I’ve got all these random pencils chosen primarily for color back when I was doing color graphs of knit designs for people. But the set I have that I really like is the one my friend Dee gave me. Unfortunately it’s from the Frick Museum and doesn’t tell the manufacturer…although I wonder if they would/could tell me if I email their shop? It’s a thought. It is! I hope you find out. Oh Laura! LOVE the watercolor rose! AWESOME job! What I need to learn better is to leave the white space and not over work. BEAUTIFUL! Feeling inspired! HAPPY FRIDAY! I’m a dancin’ today!!! It’s been a week! I love these! Especially the rosebud–I think maybe because of the color contrast between the green and red. Thank you! I really like those two shades together too. These are nice. I really like the first one. Thank you! I’m glad someone likes the tulips. I drew them from life. The mediums are totally different, but I still love my clunky pencils. I hope you and Mrs K have a great weekend. I like the first one especially because of the pencils, I think. Seeing where you layered a bit more color helps me understand something about the shape. Mrs. K and I are building vegetable beds this weekend. I’m off to Home Depot this very instant to retrieve a great pile of 2×6’s and 4×4’s. Awesome!! Have fun! I hope your weather is perfect for it. I love early May. Thank you, Jean! Have a wonderful weekend! Love your business card paintings! Look forward to seeing more of these little gems. Guessing you give these as gifts to friends and family?? Right now, I’m just playing with them, just discovered this concept a couple days ago, but I’m thinking about possibly incorporating these into my art quilts. 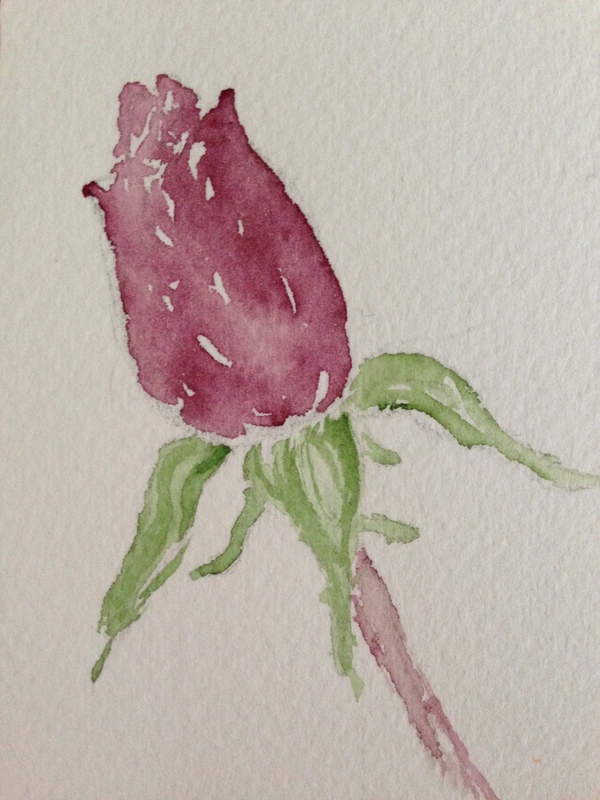 You nailed the water colour tulip. Love the bit of white that shows through. Thank you so much! I saw a DVD about letting the white show through and she was so right. It makes a huge difference. Thanks again, Jill, and I totally understand re the colored pencils lol. When I try doing portraits in other mediums though, it’s weird but they look like a first grader did them. Not sure what that’s about but it’s crazy how the medium can make such a difference! Most of my insight comes from trying and failing lol! You’re welcome. Thank you, Teresa! Tune in for another tomorrow; I’m really getting hooked on these! Who knew? Lovely flowers :-). Ahh, the sweet colors of spring! These are lovely! Especially love the softness you created with color pencil drawing, but also love the simpleness you were able to keep with the watercolor. Artist of possible interest: I am not sure if this artist is a blogger, but I follow her Facebook art page: facebook.com/WatercolorFlowers. I love the simplicity of her watercolors, and thought you might enjoy admiring them as well. Wow, thank you so much! I’m so glad you enjoyed my flowers. I was quite happy with the rose, and I feel as though my colored pencil flowers are slowly improving. It is fun to layer and layer the shading. Thanks also for pointing me in that artist’s direction! She does have a blog, here: http://www.karenfaulknerart.com/blog/ I don’t believe she’s on WP, but I followed her via an email link, as I’m not on Facebook. Thanks!! Her style is very free and easy, simple, yet beautiful. I love it, also! You’re welcome! I never paid attention that she had a blog, so I am glad you were able to find it to follow her art. Her website was mentioned at the FB page, and then her blog was mentioned at the site! I love it when a plan comes together lol! I looked on purpose, because I got off FB years ago when it was sucking away any free time I had…..WP isn’t quite as bad, I find.